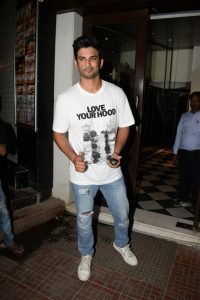 New Delhi: Actor Sushant Singh Rajput. “New Beginnings…Fox Star India and Casting Chhabra (Mukesh Chhabra),” Sushant tweeted along with the picture. With the first look of the movie out, it looks like the leading stars share a great on-screen chemistry, just like the magic the lead pair in the original movie created. The shooting for the Fox Star studios movie is in full swing with the lead pair finishing up look tests and moving in and out of the city for outdoor shoots, said a statement. The film marks the directorial debut of ace casting director Mukesh Chhabra while Sanjana will be seen as a leading actress for the first time as she earlier appeared in small roles in movies like “Rockstar”, “Hindi Medium” and “Fukrey”. “I and Mukesh share a great bond. He gave me my first film and I promised him that I would definitely be in his. This was the first film I signed without reading the script, as I know Mukesh is a terrific director. And now that I have read the script , I am glad that I said yes,” Sushant told IANS. “I am grateful to Fox to offer me a part in such an awesome story,” he added. Mukesh and Sushant go way back in the day, when Chabara discovered Sushant for his debut film “Kai Po Che”.